The DC Universe is in peril! 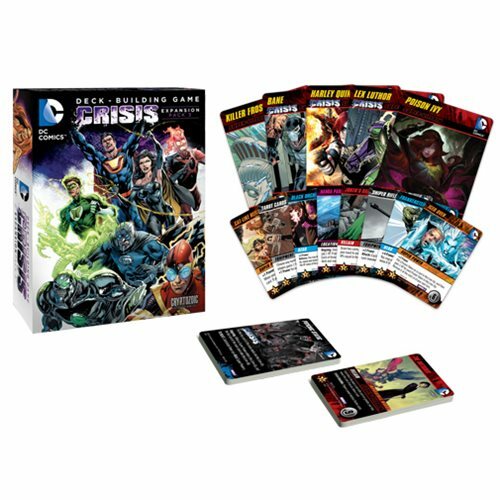 In the DC Comics Deck Building Game Crisis Expansion Pack 3, you will face some of the most epic challenges, events, and destructive forces in the history of comic-dom. In this Crisis Expansion you will find 14 "Impossible Mode" Crime Syndicate Super-Villains to battle against and Crisis versions of EIGHT oversized characters such as Lex Luthor, Sinestro, Bane and many more. This Crisis Pack features two unique modes of cooperative play! You can play in a completely cooperative mode, where players all work together to overcome challenges and foes. Or you can play in "Hidden Objective" mode, never before seen in a deck-building game! The Suicide Squad makes its debut as playable oversized characters, and as ne'er-do-wells, working together isn't exactly their strong suit. It seems someone always has their own agenda when this "team" gets together for a mission. In this mode, players are still working together, but everyone has their own definition of what a "win" really is. One player may even be secretly working against the rest of the team! The DC Comics Deck Building Game Crisis Expansion Pack 3 is not a standalone product. DC Comics Deck-building Game, Heroes Unite or Forever Evil is required to play. Requires 1-5 players. Play time is roughly 1-2 hours. Ages 15 and up.